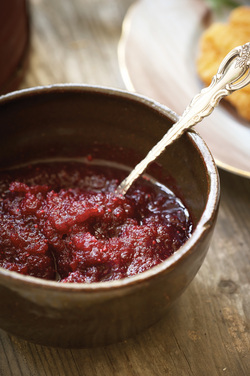 Place cranberries in a food processor and process until smooth. Combine cranberry purée, vinegar, brown sugar, cane syrup, garlic powder, onion powder, salt, and allspice in a saucepan and stir to blend. Bring mixture to a boil, lower heat to a simmer, and cook uncovered until the mixture is thick, about 10 minutes, stirring occasionally. Remove from heat and let cool to room temperature. Pour ketchup into an airtight container, cover, and refrigerate until needed, or up to 2 weeks. The ketchup also can be frozen for up to 3 months.